Our prices are competitive and you can always trust us to provide you with a reliable service at all times. Why would you pay for replacement windows when you can get them repaired instead? We offer a quality assurance money back guarantee, so you can be sure that your windows and doors will be repaired and fitted to a high standard. Come to Spot on Windows if you have a problem with misted units in Sheffield. We're always happy to hear from you, so give us a call today on the numbers at the side of the page. Alternatively, you can also get in contact with us by sending an e-mail to info@doubleglazingrepairsinsheffield.com or by filling in the contact form with your details and query. 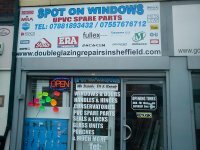 Don't forget to come to Spot on Windows when you need a company that can carry out double glazing repairs in Sheffield.